Welcome to 2014! 2013 was quite the year for both Mia and I. Moving from New Hampshire to Oregon was a HUGE undertaking and quite the adventure. My racing suffered this year in part from the move. Getting into a routine took awhile. I think 2013 was the least amount of races I have done in a long long long time. I believe I only raced 6 times in 2013. This year will be about getting back to “normal”. I like to try to race 2 weekends a month and then do things like hike, long rides, camping, etc on those off weekends. 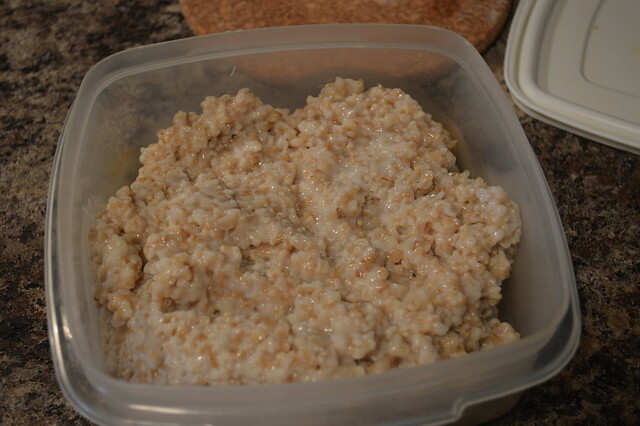 So, to start off 2014, I figured I’d introduce everyone to my standard winter breakfast, steel cut oats. I prefer these in the cooler mornings and 1 serving of this will in general keep me satisfied hunger-wise until just about lunch time. Mia and I refer to them as “cat claws” because they kinda look like what you get when you trim your cat’s claws…..anyways……What I tend to do is make a batch of this on Sunday afternoon or evening for the week ahead. I get 4 servings and it lasts me all work week with one of those days being some other breakfast choice like eggs. 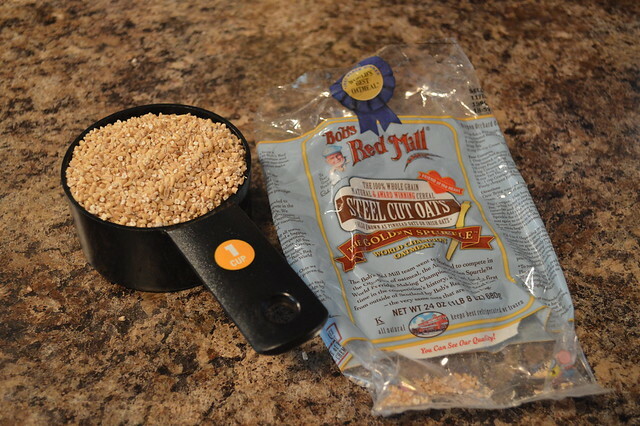 I’m a fan of the Bob’s Red Mill Steel Cut Oats. They are a local company to Oregon and they sponsor a fellow New England bicycle racer Maureen Bruno-Roy. So I have to support them, they in turn support cycling. 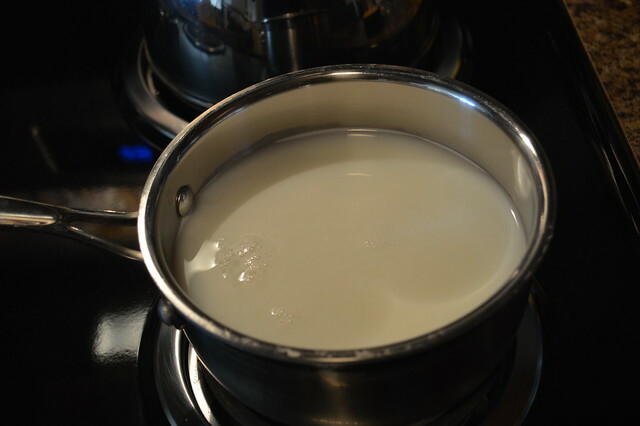 Add milk, water, salt to a sauce pan, bring to a boil, add in steel cut oats, bring down to simmer and cook for 20-25 minutes. Stirring occasionally. I like mine on the slightly mushy side so I tend to cook more towards the 25 minute time frame. 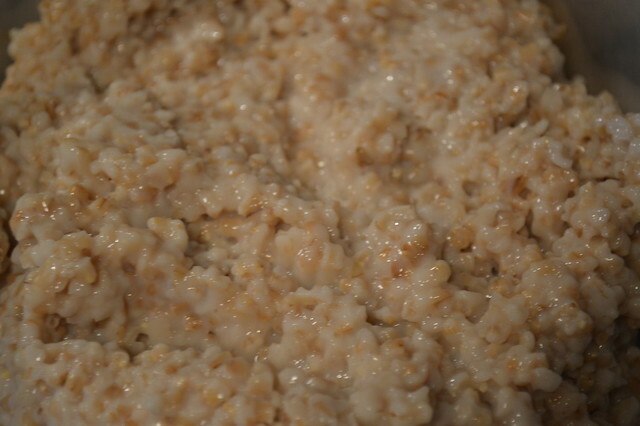 The oats start to thicken up and absorb the liquid slowly. Remember to keep stirring so you don’t scorch the bottom. After taking them off the heat, I cover and let sit for 30ish minutes with the lid on. Then I transfer them to a tupperware container and store in the fridge to the work week. To heat up for breakfast, I add a splash of milk or almond milk and then add any number of additions depending on my mood. Microwave for 45-60 seconds, stir and then microwave again for 30 more seconds. I then top off with whatever fruit we tend to have in the fridge (strawberries, blueberries, raspberries, blackberries, etc). Feel free to dollop on some greek yogurt for a little extra something too. 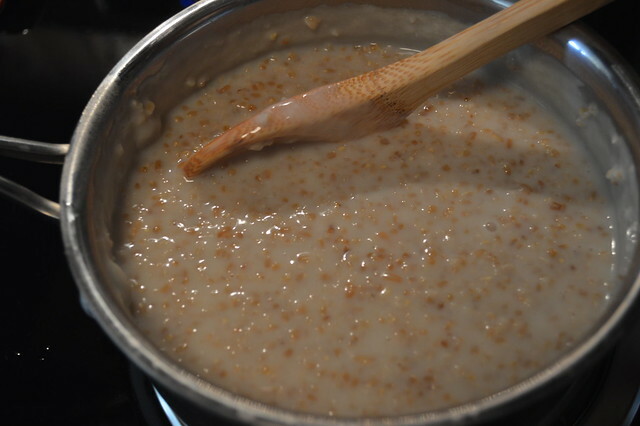 Steel cut oats are a good source of fiber and have a wonderful ability to make you feel full longer. There is also the added benefits of cholesterol reduction and some studies have indicated that oatmeal in may help you lose belly fat (I’m not making any promises). So, there you have it. One of my favorite work week breakfasts. Enjoy. Now that doesn’t look like cat’s claws now. Delicious is what it looks like. If you say it helps with losing belly fat, than I may try it… Wishing you & Mia a great 2014. Let us hear when a decision is made on that really nice Townhouse you’ve picked out…Love Ya’s Maggie/Mom..